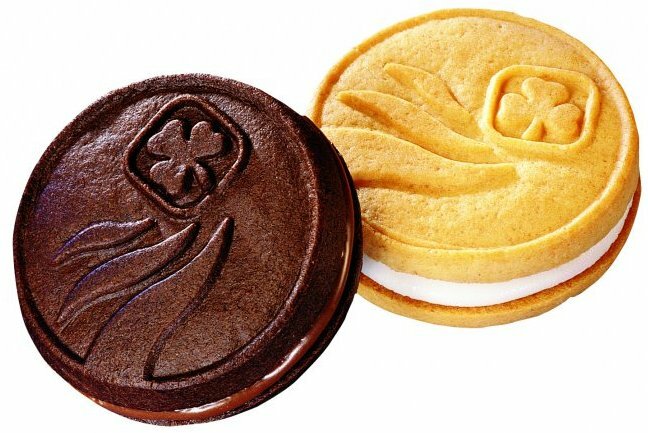 Girl Guide Cookies: you know you want some! Last year I posted about how I choose charities to support in My Charity Action Plan. This year I am giving to the same charities, but I want to do a little better. I met my goal this year of giving away two weeks’ take-home pay, and I would like to maintain donations at the same level in 2014, despite increasing my personal savings. Since I give to 5 charities annually and turn down all other requests, I get Charity Refusal Fatigue sometimes! One day it occurred to me, “Why not just say yes?” I tried it out to see how it felt and how much I spent. I would give a donation if someone asked me. This included co-workers asking to be sponsored for a run, a cashier collecting at the cash register, a panhandler asking for spare change, etc. I would buy things people were selling, if they asked me directly. First of all, I would ask the cause. If they were selling something to make a side income, I wouldn’t feel obliged. But if they were selling to raise money for a school trip or a tournament (etc. ), I would buy a small “something”. Likewise, if I chose to attend a flea market, bake sale or auction for a charity, I would buy something. If it was something I would have bought anyway, I considered it a purchase and not a donation. So, if a Scout troop was selling apples or light bulbs (as they once did! ), I would just consider them as household expenses. If I attended an event that asked for donations for a charity, I would make one. For example: a free lecture whose sponsor would “appreciate” a donation, or an event that asked attendees to bring an item for the Food Bank. If anyone asked me to attend a fundraising event with them, I would go, and pay the admission fee or make the expected contribution. If I decided to go to a dinner or concert for entertainment’s sake, and some or all of the proceeds went to charity, I wouldn’t count it. The one thing I don’t do is participate in games of chance – I don’t buy lottery tickets or raffle tickets, play bingo or keno, or anything similar. I’m not opposed to charities who get money that way – I just don’t want to buy chances of winning “stuff.” I’d rather make a donation. What all of these have in common is that I respond to a direct ask. I got that idea from Craig and Marc Kielburger, in an article they wrote about panhandlers. I don’t reply to pleas via mail or email, ads on TV or on web sites, canvassers standing on street corners or in malls, fundraising catalogues left in the staff room, or candy boxes on the counter at the bank. If someone takes the time to ask me – in person – and is waiting for a response, that has an impact on me. It’s not just guilt or embarrassment – their asking motivates me to want to give. I bought 5 items I didn’t need, but wouldn’t go to waste: a package of lollipops ($6 from one of those Dragon’s Den kids! ), a large assortment of flower bulbs for $24 (twice what they were worth, but for a good cause), a fir wreath for $15 (because baton twirlers were selling them and I was amazed baton twirlers still exist! ), a wind-up robot toy for $15 (because I would) and a little embroidered wall hanging for $10. What did it cost to Just Say Yes? For a year of saying Yes – a year of feeling relatively guilt- and shame-free. And happy to have given. Thank you for posting this – I too struggle with donations, and when to say yes and no, and then when to give! Thankfully the past two food coop events where there’s been active ‘fundraising’ I’ve been an active ‘seller’! I’m known from the first event, so I was asked again to help this week. Seems the coop folk aren’t as sales orientated as me (or just very kind to me). It’s far nicer for me to volunteer than the expected $ that might be attached to the hours of ‘work’ I volunteered, or even the ‘expected’ amounts for things. As to colleagues, I have to always say yes, thanks to my head shave. I’m also weirdly more generous than previously, after seeing how much people gave me! I don’t have any planned donations other than to the PCYC from payroll each week before pay (something like $2.50 per week) – the guy who happened to come talk to us was a coach from water polo!! And I give to the church weekly (direct debit) + into the collection plate a small cash amount, and change for a ‘cuppa’. My 2014 goals will touch on giving and charity – I think I’ll ‘give’ on a as requested basis, but put away the same amount every week, slowly building a ‘fundriasing’ fund which I might use in my benevolent old age for something grander (aka a building wing or similar, depending on funds). I was also inspired this year to give more after seeing what others were giving – I had no idea that others were as generous as they are, and I was impressed. I do think that knowing someone, or getting that face-to-face “ask” makes a difference. I like your fundraising project idea for later life! When I had a kid in school, I know I was shelling out a lot more! One thing I’m happy about is not having to do fundraising for kid activities any more (e.g. sell tickets or merchandise – even if your kid does it, you have to organize and supervise it!) There are a lot of panhandlers downtown where I live, and some at traffic lights as well, but I am not there often. To be honest, I don’t think I would respond to churches who fundraised that way! Giving time is definitely the way to go – it’s amazing how we can always somehow carve out time for causes when we’re asked! You are awesome! I am so impressed that you donated two weeks’ pay to charity! 🙂 My husband and I give haphazardly (almost always when someone asks unless we have to buy something to make the donation), but I really love how you’ve planned for this and attached a dollar amount goal. Definitely something for hubby and I to discuss – thank you! Thanks, Amanda. I should say, I’m only able to do this because we are a two-income household and “fortunate” on all counts. But I do like the feeling of being able to help causes I care about! You’ve got me there – we do have those people. I tell them that I have selected 5 charities to support all year. But others are sent out by charities I already support, like Amnesty, so I do stop to chat with them! (Amnesty says they spend 15.8% of their total budget on fundraising). I’m thinking that I will have giving to charity as one of my 2014 aims- I am thinking of giving a certain percentage of what I earn. I like your just say yes idea- although I am not sure that I actually get asked for charity donations that often…other than sponsoring friends/family for marathons etc, which I usually donate to anyway. I haven’t tried a percentage but that’s a good idea. I suppose I don’t allocate percentages for anything else (food, transport, etc.) It would be an interesting experiment! I was thinking of a percentage as what I earn might vary month to month if I work extra hours. I was also thinking of percentages for saving/spending on non-essentials. I feel a budgeting session coming on! I think I will calculate what my percentages are right now and if I feel OK about them! I love the idea of giving when asked and not being miserly or stingy. But I love more that I have just read about the UUs because of your link. The things we learn because of felicitous links!!! Thanks. What a great idea! I’m going to have to add this to my giving. I do always buy Girl Scout cookies – such a good cause – and we have a donation budget and organizations picked out each year. You give way more on a % basis though and I’m going to have to think about whether or not to increase ours. I sold so many Girl Guide cookies in my time, I could never refuse them! As I pointed out in another comment, it is easier to be generous in a two-income household. Someday when we are on a fixed income I will need to recalculate. But I am enjoying giving at this level while I can. We sponsor 3 children all year round through WV and I then give at different times throughout the year – this year to disaster fund raising and a food bank. I’m not out and about enough to get stopped in the street, but I’m always a little suspicious of giving this way, I’m not sure if I should be or not?! Your post is very thought provoking. If I’m honest, I’m conscious that my mind has limits when it comes to giving and it shouldn’t!.That’s probably linked to my fear of being destitute in my old age and my previous (or are they ongoing?!) money issues. Anyway I’m rambling! Lots to think about. Good points, Laura. I do have limits to giving – I set a budget for my 5 charities and stick to it. The amounts I listed in this post came out of discretionary spending and I found it didn’t pinch too much. If I were constantly hit up on the street or at work, I’d probably set myself a limit – maybe a certain amount in $1 or $2 coins each month. A very thoughtful post! I also give to 5 charities of my choice annually, mostly of the local (Food Bank) or environmental (Nature Conservancy of Canada, Ecojustice) nature, as well as volunteering my time with one of those organizations regularly. Also, a group I belong to, adopts a Salvation Army family in need every Christmas providing their turkey dinner and gifts for the kids. Having said all this, it is hard for me to part with money, and I wish I was more generous in nature. For me, it is a mix of saying ‘yes’ and ‘no’ to direct requests. I usually say ‘no’ to cashiers, but ‘yes’ to local kids canvassing at my door (less frequent now that I live outside of town). Well, I receive a lot of requests that are not face-to-face and I feel OK ignoring those! You have hit on one of my pet peeves – I just hate it when charities mail out unsolicited “stuff.” As you say, it must work for them, but it must turn off a lot of people like us, too! I know that CUSO-VSO sold on my info to a large group of charities so I was very unhappy about that. If I don’t hear from you in the next few weeks – Happy Holidays! Well… I have a bit of experience in this department. Basically, most non-profits participate in donor list sharing programs. They generally don’t sell your info directly to another organization, instead they either sell the use of their donor list or they have an agreement to share donor lists with other groups. What makes this practice really frustrating is that since organization 1 isn’t actually giving the info to organization 2, organization 2 cannot “take you off their solicitation list” because you aren’t actually on it! The only way to get off this treadmill is to contact the one organization that actually has your info (usually the one you actually donated to) and request that they not share your information. And in terms of the free stuff… OY! They do this because it makes people feel guilty, and that tends to make them give more money. I once gave my mother an “adopt a polar bear” gift through World Wildlife Federation for Christmas, and suddenly I was flooded with requests. It was sorta ridiculous because I’m sure that whatever environmental good my $50 donation may have done, it was far outweighed by the onslaught of solicitations, calendars, magnets, stickers, hats, t-shirts, and god knows what else that came in it’s wake. Lesson learned. From now on, I generally only give in situations where I can remain anonymous. I know one person who gives generously, but always anonymously, and never requests tax receipts, because he is opposed to receiving any gain for himself. Hmmmm… I always have such mixed feelings on this topic. Having worked in the non-profit world for so long I guess I’ve seen the darker side of fundraising and it’s left me feeling a bit jaded. But I think your distinction between direct asks and email/snail mail solicitations is a good demarcation. Although, charities know this works, and will often set about “courting” people for big donations via direct contact. Don’t get me wrong, it’s not that I don’t think people should support charities, it’s just that I also know that fundraising is big business, and a significant chunk of the money raised goes to support the raising of more money. I think I prefer to make my gifts in an unsolicited manner. That way I can still support organizations that are important to me, but avoid feeling like I’m supporting the whole “fundraising machine”. Yeah, sometimes I feel like a “target audience” and I don’t get that nice warm glow from giving! Thanks for these, Nicola! Read ’em – much food for thought! Good info; I had previously heard bad things about Children’s Wish. Thanks for sharing this, Dar. I thought about writing a post about giving, but didn’t want to admit how little I give, even in an anonymous blog – isn’t that funny? I find the subject of how much people give very interesting and helpful in determining my own giving levels. But people seem to talk about giving less than they talk about salary – which is to say, almost never. Like Lisa, “it is hard for me to part with money, and I wish I was more generous in nature.” But I’m trying to work on it. I currently give the equivalent of 3-4 days of pay. My problem is giving to me often feels like a choice between possible saving money and retiring early or helping people who I believe are more than owed it. Thinking of increasing the number of days pay I give, vs a percentage sounds better to me for whatever reason. I prefer to give lump sums however, rather than respond to every request. Oh and I hate when they ask for donations at the register – to me it feels too much like putting people on the spot when I already have designated charities I prefer to support (Charity Water and my local food bank). I do give to friends who are participating in charity fundraisers and in memory of individuals. If my budget was tighter, I would simply say to all requests that I am already supporting several charities. But I do have some wiggle room so I don’t mind being put on the spot. I suppose some other strategies might be to always give to children who ask (I know someone who does that) or to contribute to every appeal in the workplace, etc. Very cool–I would never have thought to do such an experiment. I tend to give to the same few charities that I have for years. I’ve pretty much stopped giving money to panhandlers although we do carry bottled water in the car (it’s Las Vegas) and hand them out to people panhandling at stop lights. I may have to give your system a try as it sounds like an interesting way to give. I carry a few $1 and $2 coins in my pocket and in my car for that, so I don’t have to fumble with my wallet. Very interesting post – I really like your way of handling the ‘charity bombardment’ issue! One of my goals this year was to “give more generously” and I do think I’ve made a lot of progress. I’m really not feeling the ‘sting’ of giving now and we are giving a lot more than we did. If I’m in doubt, I also try to stick with the whole idea of the “Six Corporal Works of Mercy” and I especially try to focus on charities that embrace those concerns. Hmm, there must have been a gap in my Catechism classes because I haven’t heard this term! Kind of like Zakat. Having looked it up, it makes a lot of sense. I have also started giving to a political action group that focuses on changing unjust laws. I had never heard of Zakat! I am so glad to learn these terms. I knew of Tzedakah and I love the 8 levels. Lol – this year I think I’ve unwittingly been working on level 1: “Giving Begrudgingly”! Now you’ve taught me something – I loved reading about the levels of Tzedakah! I am realizing I have a lot to learn about how to give! It does get hard, sometimes I feel a little besieged especially with phone calls from charities. Like you I have some favourite charities though. Yesterday though, I bought a copy of The Big Issue which is sold by homeless and people with disabilities to make some money for themselves. I think it’s a great idea. Oh, we have one of those here; it’s called Street Feat. You have a great system here. I donate to our church, a camp for those infected and affected by AIDS, our local library… and I give $1 every time I see a bell ringer, usually by end of season I have given between $15 and $20 dollars. My employer has a system where a portion of our paycheck can be donated to the charities we select. You can do a lump sum or have a minimal amount taken out each week throughout the year. It makes it a lot easier to donate when I’m not even missing the money. I contribute a lot more this way than I might otherwise. Great idea! We only have that available for one charity.